Exactly five years ago, I decided to start a blog (the above was the earliest I could dredge out of Wayback). I was a regular reader of various religious newssites, and I thought there was stuff there which ought be more widely known and discussed. Also, I often found myself chasing up background to news stories out of personal interest, and I figured that I may as well make my findings known. Plus, like everyone else, I liked the idea of a forum where I could sound off about commentary I found wrong-headed. Little did I expect then what a great learning experience running a blog would be – I’ve become interested now in a whole list of topics I had no idea even existed back in February 2004: these include too many Christian right and Christian Zionist figures to mention; a “UFO summoner“; bogus anti-Muslim pseudo-experts; Islamist attacks on the polio vaccine in Nigeria; child witches; a slew of crackpot commentary on WorldNetDaily; Rev. 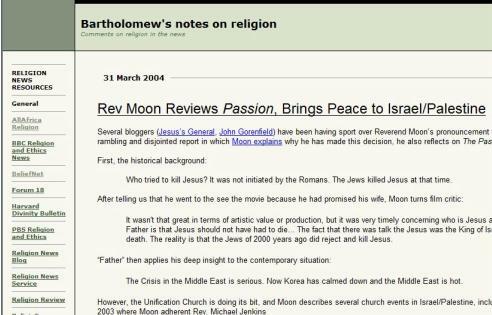 Moon’s attempts to gain credibility through the Universal Peace Federation and through former Roman Catholic Cardinal Emmanuel Milingo; the neo-Pentecostal grouping now known as “Every Nation“; the pseudo-libertarian “Tory loony right” of the 1980s; Holocaust denial in Iran; Byzantine conspiracies in the Greek Orthodox Church in Jerusalem; and, of course, issues of free speech in a country where libel law is used by the rich and well-connected to bully and silence those who investigate issues of public interest. I’ve also greatly appreciated the comaradie and support of other bloggers over the years. So – time for a few “shout outs”; apologies if I’ve missed anyone. When I started, I was part of the Salon blogging community, and my first regular contacts were made there: in particular, Vincent of the now-defunct and deleted Religion Related Injuries and Dave Rattigan of The Grace Pages. Soon I was also welcomed by SZ of World O’Crap, who liked my take on the absurd Florida pastor Doug Giles and who brought me into contact with the lads at Sadly No! and with the wonderful Pete M. of the much-missed Dark Window. Pete and I had a nice act for a while – he would dig out strange wingnuts and make fun of them, and I would fill in with some background details. An obscure and ancient wingnut named Wilson C. Lucom became a particular obsession for us both (or maybe just me and he was being polite). 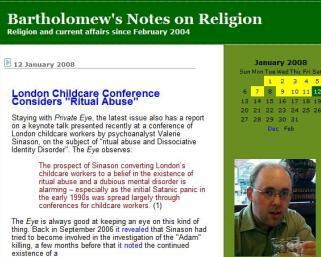 Other early contacts of this time included Ted Olsen of the Christianity Today Weblog (also sadly no longer running), Lilith Saintcrow, Ed Brayton, PZ Myers, and two great writers at The Revealer who have been hugely supportive: Jeff Sharlet and Kathryn Joyce. Somewhere along the line I was also brought to the attention of Gen. J.C. Christian (Patriot), and I recall that my very first comment was from Miss Poppy Dixon. John Gorenfeld was also nice get comments from – his famous Rev. Moon “coronation” story still sets the standard. After a while, Bruce Wilson and Frederick Clarkson got in contact and brought me on board Talk to Action, and I’ve helped bring a couple of things to the attention of Terry Krepel at Conwebwatch and to Bill Weinberg at World War 4 Report (Back in 2006 I also showed Bill around Osaka, where I was living). Over the last couple of years, I’ve moved more into the orbit of the Brit Blogosphere, and it’s been nice forging links with Sunny Hundal and Rumbold at Pickled Politics and with Tim Ireland of Bloggerheads. I particularly would like to thank those who spoke out when I was under threat: David at MediaWatchWatch, Alex the Yorkshire Ranter, Bene Diction, and Modemac of the Church of Subgenius’s Bulldada Newsblog. The late Rev. Tom Allen of Big Bulky Anglican and Simon Barrow of Ekklesia were also supportive at that time. It’s nice to have such a diverse list of readers and linkers; cheers to everyone. Congratulations, enjoy the next five years. Congratulations, and thank you for five years of interesting writing. The best thing about Bartholomew’s Notes on Religion is the way you cover subjects involving religion and the media that differ from the subject we see in the news over and over regarding religion — gays, abortion, gays, stem cells, gays, priest sexual abuse, gays…oh, and did I mention homosexuals? Religion (and actions taken in the name of religion) has a greater influence on our society and the media that cover it than one might think, yet this is rarely given a spotlight in the mainstream media. That’s where blogs like yours come in, to offer opinions and research uncovering the details behind these stories that might never otherwise see the light of day. Many, many congratulations, Richard. Your Notes helped urge me to start my own blog in 2005. Since then, you’ve kept me company through religious studies graduate school and working as a religion journalist. Many thanks. I’ve just posted a shout out over at Killing the Buddha, where you’re much loved. Crikey, that is a long time. Thanks for the kind words. Congratulations, Richard; a superb blog. Crikey, that is a long time. Not when you’re my age.